This is a reader-submitted story. Want to share your 30 Things? 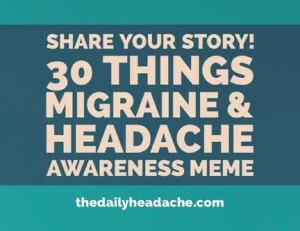 Here’s how: Migraine & Headache Disorders 30 Things Meme. 2.My migraine frequency is: 2 migraines in 48 hours immediately prior to or at the start of my period each month. 3. The first migraine I remember is: at age 21 when I was prescribed the oral contraceptive pill. I had aura and pain so bad, I banged my head against the wall to try and make it go away. Didn’t work. 6. My co morbid conditions include IBS, depression, anxiety and PMDD. 7.I take NO pills for prevention. 8.In addition to pain, other symptoms I experience are nausea, vomiting, diarrhea,loss of appetite,irritability, photosensitivity and brain fog. 9. Treatments I have tried: paracetamol, antinausea, naproxen, ibuprofen and codeine. 10.During a migraine attack I: take pain pills and go to bed in a dark room with a cold compress. And a bucket by the bed. 11. My migraine is triggered or gets worse with: PMS, stress, bright lights, rotating ceiling fans. 12.The most frustrating thing about having migraine is: the lack of understanding/empathy. 13.Having migraine causes me to worry about: vomiting in public and not being able to get home quickly. Embarrassing myself. 14.When I tell someone I have migraine, they usually say: (or tell me about their friend/relation who has it, and isn’t that bad). Feels like it minimizes my experience. 15.when I see ads about migraine: I don’t usually believe them, especially if they seem like a miracle cure. 16.my best coping tools are: bed rest and a cold compress. Codeine works sometimes. 18.I get angry when people say: its not that bad or try to convince mevof a miracle cure or supplement. 19. I like it when people say: I hope you feel better soon. 20.Something kind someone can do for me during a migraine is: change my cold compress regularly. 21.The vest thing a doctor has said to me about having migraine is: there are lots of treatments we can try, I’m not giving up. 22.Having migraine has affected my work by impairing my concentration and sometimes having to call in sick. 23.the hardest thing to accept about having migraine is I might have it my whole life and that is depressing. 24.Having migraine has taught me how sensitive my body is and that I must pay more attention to my stress levels. 25. I don’t really have a quotation or mantra. 26.if I could go back to the early days of my diagnosis, I would tell myself ” this is only 2 days a month, not my whole life”. 27.The people who support me most are my doctor and my friend Tracy. 28.The thing I wish people understood about migraine is there is no single cause or cure. Constant pain, with severe attacks, weekly. Attacks lasting 2-15 days. 4. My comorbid conditions include: Depression and fatigue. 5. I take 8-10 medications/supplements each day for prevention and 2-5 medications/supplements to treat an acute attack. When I was probably 6 years old. At a health fair I ate a cookie that triggered a migraine exercise. I remember the smell of maple frosted donuts. The scent still makes me shudder. Mind numbing pain. Crippling fatigue. Constant yawning, my movements seem like I have Parkinson’s, even my steps get jerky. Intense conversation, math, stress, sugar, lack of sleep. When I notice I’m yawning too often. I get grouchy for no reason; irritated by voices or noises; I don’t want people touching me or too near. Loosing my ability to do things I need to do. Giving up my time, my life. Longterm damage. People’s judgments. How long will “this one” last. Loosing my ability to work. Loosing my sight. Sleep. Rest. Solitude. Quiet. Prayer. My bed. My familys’ love. Dark, quiet, soft bed. Give me permission/encouragement to go to bed. Offer to bring dinner to my family, or help my husband with things. This is my lot in life. I won’t be cured. I will pass this on to my children. Not to overestimate my health, and appreciate when I have energy. My family. Husband, sons, parents, sister, cousins… all of them are incredibly loving and sincere. It’s not a ploy to get attention. It’s worse that it looks. Awareness is most the battle for those of us with invisible illnesses. People need to support the spouses and children too. It has made my husband the most patient man on earth. This pain doesn’t punish just me, but my while family. I am a pitiful excuse for a wife and mother during my attacks, and they are affected as much or more than I am. I wish people would help him/them when I’m down. 3. I was diagnosed in: 2008 after I graduated from high school, though i have had migraines most of my life..
6. My first migraine attack was: when I was in first grade. The only one to believe me was my mother. 7. My most disabling migraine symptoms are: vertigo, slurring of speech, unable to make sense of things, severe sensitivity to lights and sounds. 8. My strangest migraine symptoms are: inability to speak correctly or think. Hand & face numbness/tingles. Right eye twitching. 9. My biggest migraine triggers are: hormones, lack of sleep, stress, crying. 11. The most frustrating part about having a migraine attack is: letting friends & family down. Having to give up any social activity. Worrying about traveling or driving far incase a migraine attack occurs. 12. During a migraine attack, I worry most about: if the pain will ever go away, even most abortive medications dont help when theyre bad. 13. When I think about migraine between attacks, I think: one day I’ll find a helpful prevention. I never take for granted my pain free days. 14. When I tell someone I have migraine, the response is usually: I dont usually tell people unless its happening and i need them to understand what is wrong with me. Most people i interact with know i have them. I occasionally get the “oh yea i get those too” which then we compare notes on helpful tips, etc. 15. When someone tells me they have migraine, I think: i feel bad for them. I know how debilitating migraines can be. We will usually talk and compare different symptoms, sort of ‘bonding’ if you will..
17. My best coping tools are: my family, mostly my mom..she is fantastic. my boyfriend supports me beyond belief and never once resents me for not being able to do things. My loving cats…petting them while they lay on me and purr is the most comforting thing. Also abortive medications supplemented with ativan due to severe anxiety. 19. I get angry when people say: “its just a headache” or some variation. Or oh just take an advil. I wish i could lol. For the most part people are becoming more aware and supportive. 20. I like it when people say: i understand & you need to take care of yourself. 21. Something kind someone can do for me during a migraine attack is: if you’re close to me, rub my head. If you’re not just speaking softly and understanding that i am in severe pain. 22. The best thing(s) a doctor has ever said to me about migraine is: we will work to find something that helps you. I have had many neurologists talk down to me or not speak to me like I’m a person suffering because i am young and they dont wanna help because of “drug seeking”..? 23. The hardest thing to accept about having migraine is: i will struggle the rest of my life. 25. The quotation, motto, mantra, or scripture that gets me through an attack is: i dont really have one..but i do tell myself that i will get thru it, i always do. We are survivors and we can continue to survive. 26. If I could go back to the early days of my diagnosis, I would tell myself: nothing. Same struggles as today..
27. The people who support me most are: my mom & my boyfriend. 29. Migraine and Headache Awareness Month is important to me because: it shows that it is a chronic illness and that researchers and doctors are actually starting to see it as a neurological disorder. 30. One more thing I’d like to say about life with migraine is: every day is a struggle, but its our struggle. One day i hope to see a prevention that helps every day go easier and lessen the pain, but until then I will continue to remain positive. I also just hope that all of my friends understand that i dont want to blow off plans or never agree to to plans for sure just so i wont let anyone down. 2.My migraine frequency is: 2 migraines in 48 hours immediately prior to or at the start of my period each month. They are getting worse closer to menopause ( I am 46). 9. Treatments I have tried: paracetamol, antinausea, naproxen, ibuprofen and codeine. Codeine is best. 10.During a migraine attack I: take pain pills and go to bed in a dark room with a cold compress. And a bucket by the bed. I hate vomiting and often get very panicky like an anxiety attack. 15.when I see ads about migraine: I don’t usually believe them, especially if they seem like a miracle cure. Because I know there isn’t a cure. 18.I get angry when people say: its not that bad or try to convince me of a miracle cure or supplement. 21.The best thing a doctor has said to me about having migraine is: there are lots of treatments we can try, I’m not giving up. 22.Having migraine has affected my work by impairing my concentration and sometimes having to call in sick. Not being able to work in brightly lit areas. 29.Migraine and Headache Awareness Month is important to me because: its a reminder that millions of other people live with migraine and there is a great support network out there. 30.One more thing I’d like to say about migraine is: never underestimate the pain, suffering and angst we go through when we are labelled as hypochondriacs. We aren’t making the pain up and we aren’t pretending to be in pain up to get attention. We need your empathy and understanding. 2. My migraine attack frequency is: It changes constantly. It used to be every day, then it was once or twice a week, but lately it’s back to everyday. 7. My most disabling migraine symptoms are: The pain and nausea. 8. My strangest migraine symptoms are: I can’t remember words. 10. I know a migraine attack is coming on when: I really haven’t noticed any warnings. 11. The most frustrating part about having a migraine attack is: They happen so often and without warnings. I can be at the grocery store and suddenly my head starts to hurt. 12. During a migraine attack, I worry most about: The pain getting so bad I have to go lie down. 13. When I think about migraine between attacks, I think: I hope I don’t get one today. 14. When I tell someone I have migraine, the response is usually: Have you tried this? It helped so and so. 15. When someone tells me they have migraine, I think: You poor poor person! 16. When I see commercials about migraine treatments, I think: Maybe I should ask my doctor about this. 17. My best coping tools are: Scented oils. I really love the doTERRA Tension Blend. 18. I find comfort in: My mother knowing how bad they can get. She’s been here for me. Also, my cat. 19. I get angry when people say: It’s just a headache, deal with it. 20. I like it when people say: I hope you feel better soon. 21. Something kind someone can do for me during a migraine attack is: Leave me alone or bring me stuff. 22. The best thing(s) a doctor has ever said to me about migraine is: We’ll find something that works. 23. The hardest thing to accept about having migraine is: I will always have them. Maybe not as often, but they will never go completely away. 24. Migraine has taught me: That everyone’s migraines are different. Just because yours aren’t that bad doesn’t mean mine are not. 26. If I could go back to the early days of my diagnosis, I would tell myself: This is nothing, it’s going to get worse. 27. The people who support me most are: My mommy. 28. The thing I most wish people understood about migraine is: It’s not just pain. It’s nausea and throwing up, it’s being tired and weak. It’s not being able to concentrate. 29. Migraine and Headache Awareness Month is important to me because: It’s helps people learn more about migraines. 30. One more thing I’d like to say about life with migraine is: You can’t fully control these things. Just leaving the house to go get the mail is a battle sometimes.